My kids are required to put book covers on their school books, but I just can’t bring myself to buy a $4 book sock! And–have you actually tried to handle a book covered with a book sock? It makes the book slippery and difficult to hold. Back when I was a teenager, we made our own covers. All we needed was a paper grocery sack and a little bit of tape. Anyone else remember making those? 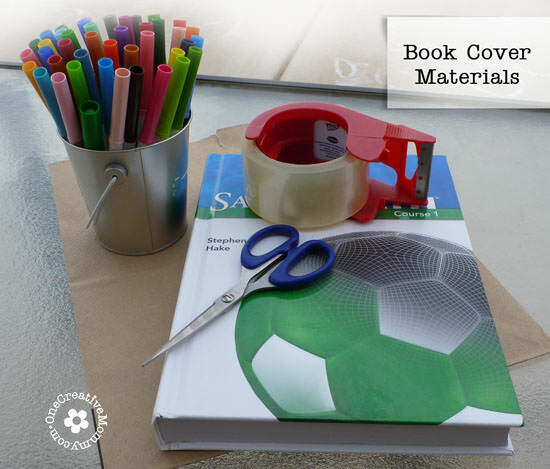 So, if you’re ready to get a little creative and have a little fun, I’ll show you how to upcycle butcher paper, a paper bag, wrapping paper, or any paper into a unique book cover with my easy tutorial. 1 large paper grocery sack or butcher paper (I’ll show you both ideas. My butcher paper came from a roll of drawing paper the kids use for coloring). You could easily do this with any paper. 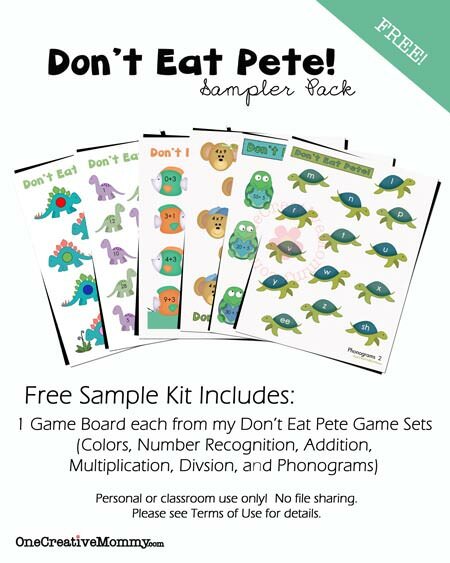 Tape together coloring book pages or drawings made by the kids until you have a large enough piece to cover the book. Markers, paint, crayons, or colored pencils for decorating (permanent markers work well). Stickers would be fun, too! This first method uses butcher paper. You’ll find the paper bag book cover after this one. Using any materials you would like, decorate your butcher paper. 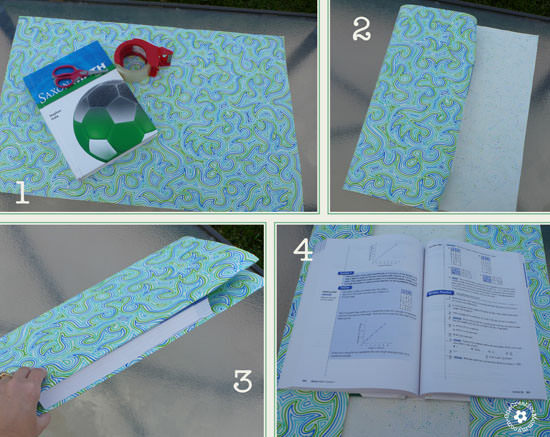 (You could even use wallpaper or wrapping paper so that you don’t have to create your own design.) I created this one by drawing the design I’ve been doodling since I was in junior high! It looks kind of like wrapping paper, don’t you think? Nope. It’s just white butcher paper and markers. 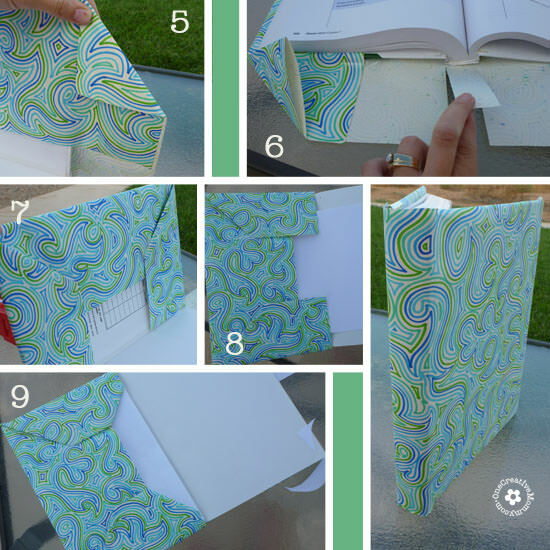 Wrap the paper around the outside of the book, folding the edges inside the book. Make sure your overlap is fairly even on both sides. Fold the corners in like you are wrapping a gift. Slit the bottom and top so that you can remove the overlap on the book spine. Fold in the sides and tape them down. Optional* Slide an extra piece of paper under the book cover. 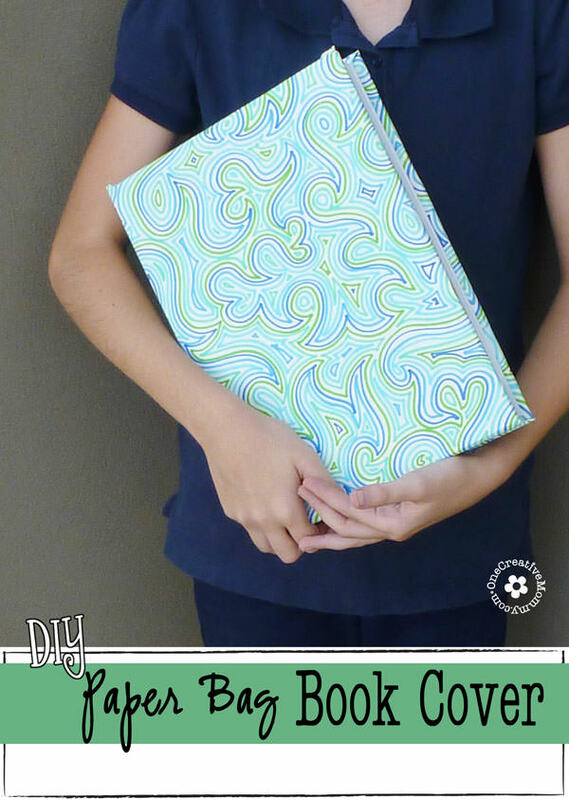 Fold the edges of the book cover in to make the edges look more finished. Not pictured (because the tape reflects funny off of the camera lens). Cover the entire piece of butcher paper with packing tape to create a protective, durable finish. *This step is optional. You can leave off the tape. The cover just won’t last as long. Because the colors show up better, I prefer the butcher paper book cover. 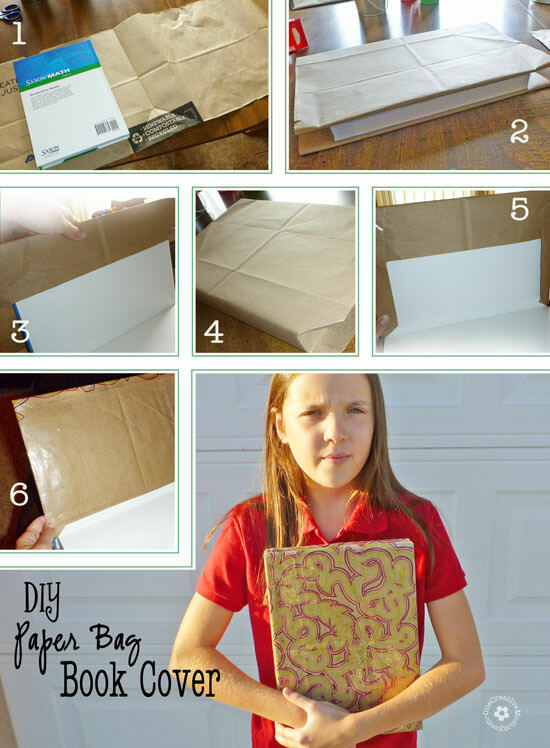 Paper bag covers are completely free, however, and a little more durable. If you’re not worried about color, I’d go for the paper bag. This cover is created almost the same way as the other design. Start by slitting open a large paper bag and removing the bottom of the bag. Continue on with the same directions as above. My original book cover was made from a recycled paper bag. It worked great, but Bear and I decided to make a new one because the vibrant colors she wanted didn’t show up well on the brown bag. You may notice that the inside of this book cover looks a little different. I put the extra paper over the folded edges instead of under (Step 6 in the picture). So, what do you think? Will you give it a try? I’m a little biased, but I think the make-your-own book covers are so much more fun than the ones at the store! Have fun! *This idea was originally posted in September of 212, but has been updated with new photos and ideas. I did the paper bag version for all my books back in high school! Loved it cuz you can draw all over them. :-) Thanks for sharing at The Fun In Functional! I used to draw all over mine, too, Jessi! That was half the fun! Thanks for popping by! 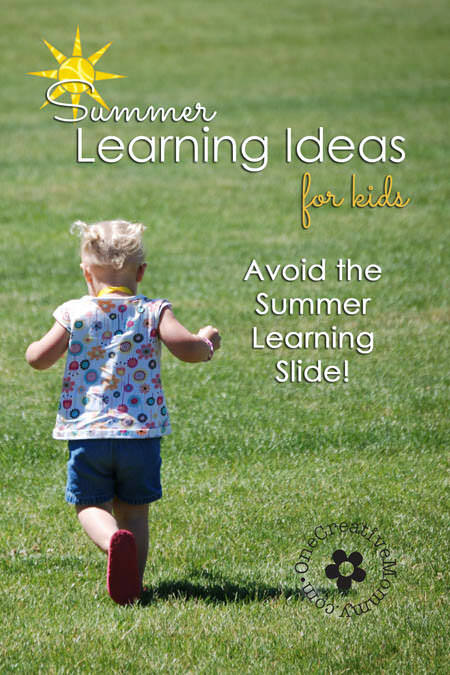 Perfect timing for back to school! Thanks for sharing this at Keep Calm and Link Up this week! Can’t wait to see what you link up next Friday! I really like the one covered with wrapping paper. You could also do that for ugly books that might not make it to the coffee table otherwise. Great idea! Thanks! That’s actually not wrapping paper. It’s a drawing. Cool to know that it looks like real wrapping paper! I thought it was wrapping paper too!! What a beautiful design!! Thanks! I’ve been drawing that same doodle since I was a kid! I remember making these for my books way back in high school. Ah, the memories. :-D Thanks so much for sharing on Tout It Tuesday. Hope to see you tomorrow. What a great tutorial!! I remember always making mine from paper bags as a child or the school would get free ones from local businesses. Thank you for sharing at Sharing Saturday!! We used to make these when I was a kid! Haven’t seen them in so long. They work great and those ones at the store are not worth the price. Thanks for sharing at Gettin’ Krafty this week! Love this! I still remember covering our books with paper grocery bags and then doodling all over them. I used to do the exact same thing, Barb! I remember even wanting to save a few at the end of the year. Memories! Thanks for hosting, Jess. I always love your parties! I remember doing this and vowed to have my kids do the same. Can’t stand the book socks either. 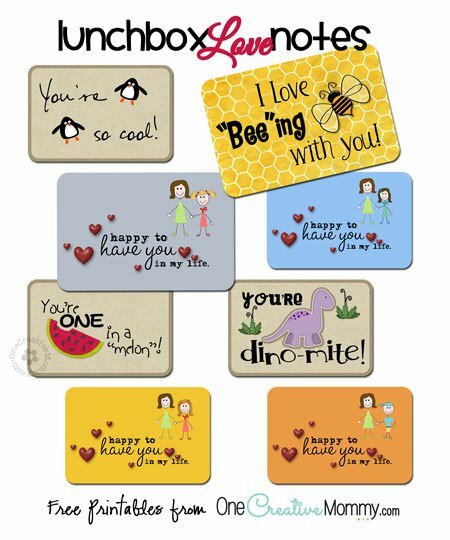 Love your pattern btw! Thank you for linking up to the Bloggers Brags Pinterest Party. I have pinned your post to the Bloggers Brags Pinterest board. Thanks so much, Carie! My kids insisted on book socks last year, but we are back to paper this year. The socks are so slippery! Thanks for the pin. You did such a great job with these book covers! Again, thanks for coming and linking up at The Weekend Social. All posts get pinned in our pinterest board! Please be sure to come back next week starting Thursdays at 9PM EST on culinaryflavors.gr ! I hope to see you there! Thanks so much for stopping by and commenting, Katerina. I always love your party! You’re welcome, Debi and Charly! Thanks for popping by to leave a comment! This is a great idea! I love how you decorated your covers. I do remember having to cover our books with paper bags as a kid. Thanks for sharing with Creative Spark Link Party. Thanks, Glenna. We’re getting ready to do a new batch this weekend! neighbors to go to, then you will not gain extra experience and coins. Tony Aceti lives in central Oregon, where he farmed, developed land and made a few bucks. if you really have enough time, here I would like to tell youu these useful tips to you, and tthen you can easily make WOW gold in the games. There are new exciting updates for this game and you can enjoy new stages and challenges. Should your granary ever be destroyed, youu will lose all the food that was contained in them, which will negatively impact your popularity in turn. All that you can get it from this side is the ultimate idea to rock and roll as per the game. else, as cars usually compete in unique ways.